Picture bottom: one second later it has been neutralised. Personal acquaintance with Arion lusitanicus took place for the first time in 2000, when 4000 snails were collected on a few hundred square meters. They flocked on nearby green spaces and the inflow was growing. An electric fence kept the plague in check. In 2008 the influx seemed to have peaked and in 2009 the electric fence could be shut off. Large concentrations of snails on nearby green areas had simply moved to new areas further afield. The Snail is certainly not extinct, but after seven years natural enemies and diseases have taken control on this particular spot. 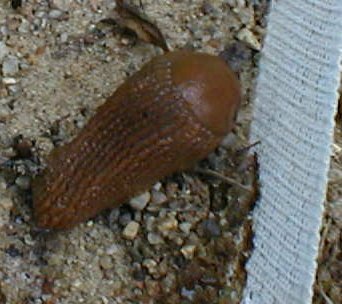 Arion lusitanicus Mabille 1868 is considered a major slug pest of European agriculture. This pest originated in south-western Europe at the Iberian peninsula. It has now spread as far north as Scandinavia. In Denmark the first specimen was found in 1991. In the United States it has not spread yet, but it was found at Cornell University in October 1998 and has been reported as far away as the Falkland Islands. The slug is not specific in its food requirements but is considered a pest of a wide range of vegetable crops in Europe - including the potato as the natural insecticide 'solanine' is not effective against the snail. The Latin name "Arion lusitanicus" is still the name used in English speaking countries, which are not yet plagued, but in continental Europe it has even nicknames. In Denmark: "Iberisk skovsnegl", "Iberiaskovsnegl", "Den spanske skovsnegl", "Dræbersnegl". In Sweden: "Den Spanska skogsnigeln", "Mördarsnigeln". In Norway: "Iberiaskogsnegl", "Mordersnegl". In Holland: "Spaanse wegslak". In Germany: "Kapuzinerschnecke", "Die Spanische Wegschnecke". Arion lusitanicus is a night slug - hiding under vegetation, in dark and moist places, during the day. It is most easily observed in the twilight. The colour is everything from dark brown over reddish to yellowish colours. It is a naked snail and looks like its black cousin 'Arion ater' and the red 'Arion rufus', from which it cannot be distinguished without microscopy. Length: 7-15 cm; Crawling speed: 5-9 m/h. Occurrence: Unto fifty snails per square meter. In plagued gardens 20 to 100 snails may be collected per day. If a reddish brown snail is observed in large numbers most probably Arion lusitanicus is at work. A questionnaire distributed August 2000 in a residential district encircled by green space studded with snails revealed, however, little or no interest in doing something serious about it but complaining. Some spaces, however, are so infected, that the slugs are driving residents mad. Other researchers report annoyed people ready to move. July 2002 the Danish Ministry of Environment declared war against the snails. The snails create headlines in the media. Slug control. Traditional poison and deterrents may be used, but in the case of Arion lusitanicus the chemicals have to be replaced after rain because of massive immigration from adjacent green areas. Traps and manual collection are measures to keep down the number. A copper tape (not tested) looks attractive because it may have a lasting deterrent effect and even better if the copper tape is turned into an electric fence by connecting an energiser. Sodium iron EDTA is advertised as a safer alternative to the metaldehyde and methiocarb-based slug and snail baits. Iron phosphate. www.biconet.com/crawlers/sluggo.html After eating the bait, slugs and snails will stop feeding, become less mobile and begin to die within three to six days. Salt acts by extracting water. Copper barrier tape: www.greenfire.net/hot/P350.html When slugs or snails contact the copper barrier a small electrical charge is released, repelling the beast. It lasts 3-5 years. Approx. retail price 1-2 USD/m. A beer trap: Bury a tuna can up to its rim and fill it with stale beer. Keep it emptied by checking it for bodies each morning. Nematodes (Phasmarhabditis hermaphrodita): The effect on Arion lusitanicus is doubtful. Supplier of "Nemaslog": "Organic Gardening", Coomelands House, Addlestone, Surrey, KT15 1HY, England. Diatomaceous earth: dries out slugs just like salt, but doesn't add salinity to your garden. 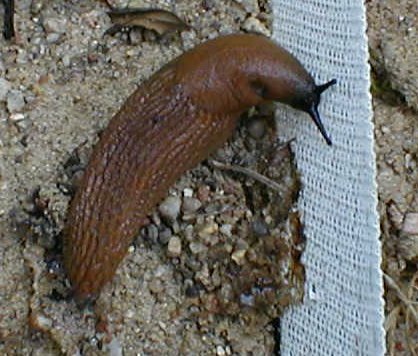 Metaldehyde: Kill slugs which contact this material by crawling over sprayed surfaces. It does not have to be eaten as in the case of bait. Copper sulphate - effect like metaldehyde. Metallic fence with a 6 cm 55o downwards sloping head is difficult to pass because the snail will drop off the bend. Information: "Borregaard Bioplant" +45 8678 6988.